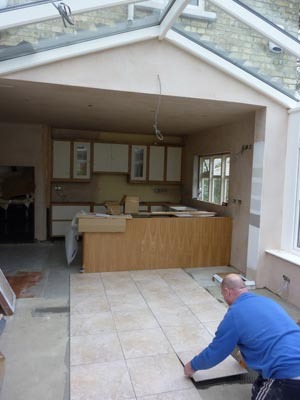 Phil is dodging rain showers to try and get the walls built for this conservatory in St Albans. We’re using a Flemish Bond with snapped headers to match the brickwork on the main building. 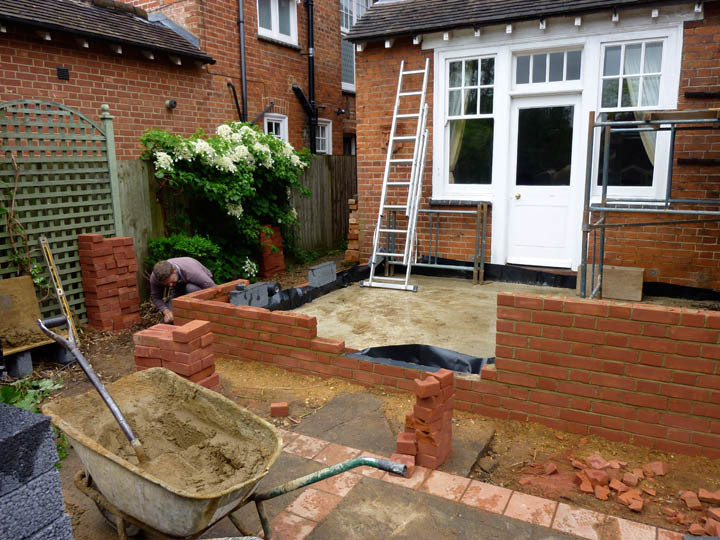 It can be tricky when joining brickwork to two existing walls; it is not unusual for the brick levels on the existing house to run out. This means that if we match the brick gauge at one side, build our walls level, they would not line up with the brickwork on the other end. However on this job things are ok. If they weren’t, we would have to match the gauge at the most prominent end and disguise the misaligned joints with a down-pipe at the other. The other alternative when faced with such a scenario would be to run our new brickwork out of level, but then this would show up on the conservatory frames and create greater problems. We occasionally get similar issues when joining to two floors that are supposed to be the same level. I wasn’t aware that M.C. Escher built houses?